In the eighteenth century Nova Scotia received occasional shipments of English pennies and halfpennies. However, after the American Revolution the shipments became fewer, and after 1795 they stopped altogether. In the early nineteenth century the colony was so short of copper coinage that, about 1814, some of the individual merchants of Halifax began to import halfpenny tokens from England to alleviate the chronic shortage of small change. Some of these bearing popular slogans such as SUCCESS TO NAVIGATION & TRADE or FOR THE CONVENIENCE OF TRADE were issued anonymously; others bearing the name of the merchant also served as advertisements for the issuer. 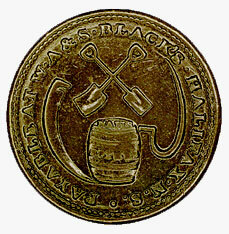 The token illustrated, which was issued in 1816 by the hardware merchants W.A. and S. Black of Halifax, is an excellent example of a merchant's advertising piece. The scythe, crossed shovels, sickle and keg - inscribed NAILS at the top and SPIKES on the side - clearly indicate the business of the issuer. The firm was established circa 1812 by William Anderson Black and his brother Samuel, the sons of the Reverend William Black, one of the founders of Methodism in Nova Scotia. W.A. Black took a prominent part in public affairs in the province; he sat in the provincial legislature and served as lieutenant-colonel of the 4th Halifax Regiment. When Samuel died, W A. Black and his family became sole owners of the establishment, which was one of the foremost business concerns in Halifax. The last members of the Black family retired from the business in 1871. This copper token, slightly larger than a twenty-five cent piece, is part the National Currency Collection, Bank of Canada.